Yo! Another Card of the Week is upon us, and this time the focus is on a Named card from Heroes & Villains. Gaining 6 anger from a single card would be useful with any MP, but Trunks has some of the most desirable Powers in the game. Unlike Captain Ginyu’s Body Change or Goku’s Kaio-Ken, Trunks’ Sword Stance is not a reliable form of backup physical defense. However, its “when entering combat” usage allows you to chain it with your Powers – or perhaps even another copy of Trunks’ Sword Stance! Consider Trunks with Red Empowered Mastery, where a single copy of Trunks’ Sword Stance on Level 1 will allow you to level up, draw the card you selected to place on top of with your Power, and then use your Level 2 Power. On Level 2 and beyond, things can get wild! But Trunks Swords stance leaves you with -1 card advantage for the entire combat. And, when your opponent enters combat, you can only use it when it was the 1 card left over in your hand (not in the 3 you draw). Plus, Trunks level 2 doesn’t give you any card advantage. 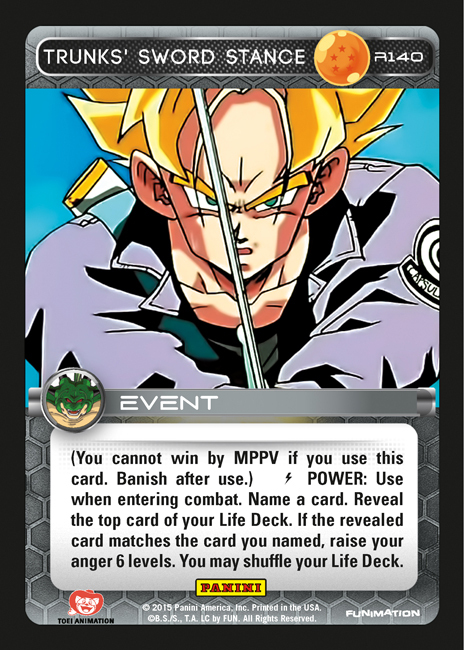 Even if you use Trunks Swords stance to get to level 3, you still are net 0 card advantage after drawing your extra card. No wonder Trunks has done so poorly in Set 2. Why even run Trunks, when Ginyu at level 1 gets a guaranteed energy attacks + ally tutor + potential ally action? That can be up to 3+ card advantage consistently from the get-go. Trunks does need this card effect, though. The shuffling effect is icing on the cake to compliment his abilities (yet it’s not really talked about here, go figure). My only complaint with Ginyu, since he was brought up, is that Overpowering Attack isn’t Heroes Only. That’s a layer of redundancy he really doesn’t need.